You are here: Home / News / Mariano Rivera: Forever linked with Jackie Robinson and baseball history. Mariano Rivera: Forever linked with Jackie Robinson and baseball history. (ThyBlackMan.com) Baseball has long carried the moniker of “America’s pastime” but that moniker is debatable today with the emergence of football and various other sports that are faster paced. However, the long history of baseball still holds an important place in sports and history was made earlier this year when The Baseball Writers’ Association of America announced the 2019 Baseball Hall of Fame inductees including former New York Yankee pitcher Mariano Rivera. Rivera’s induction was not surprising at all but it was surprising that he became the first player in MLB history to be a unanimous, first-ballot inductee. The man considered the best relief pitcher and closer in Major League Baseball history was a lock to be in the Hall of Fame but the history that Rivera has made by being on 100 percent of the Hall of Fame ballots cast is only one of the most important historical notes that follow his storied career. As a native of Panama, Mariano Rivera did not attend an American college or university prior to his arrival to Major League Baseball. He had very humble beginnings in Panama with the game of baseball as a child including substituting cardboard milk cartons for gloves, tree branches for bats, and fashioning balls by taping worn-out baseballs and wads of shredded fishing nets. He was signed by the New York Yankees in 1990 and worked his way into becoming the closer of the New York Yankees in 1997 and held the job for 17 seasons. Playing for one of the most high profile sports franchises in sports history comes with a significant level of pressure and that was compounded for Rivera with the number that he wore during his playing career, number “42“. Every season, the number “42“ is celebrated in Major League Baseball each April 15 since 2009 on Jackie Robinson Day. Jackie Robinson, who broke baseball’s color line over 70 years ago, is considered one of the more important people in American history over the last 100 years. As a black man making history during the 1940s, he encountered an incredible amount of hatred and vitriol on top of the pressure of playing in Major League Baseball. 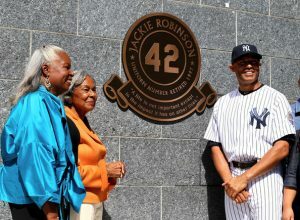 While Mariano Rivera isn’t “black”, he was also a beneficiary of Robinson’s breaking the color barrier as well. The link between Jackie Robinson and Mariano Rivera extends past the number “42“ in other ways. During Jackie Robinson Day, all players and on-field personnel across the league wear number 42 jerseys. During the his final Jackie Robinson Day as a player, Mariano Rivera, as the last Major League Baseball player to wear 42 full-time, said, “I have always said that wearing this number is a privilege and a great responsibility … to represent what Jackie represented for us, as a minority, and for all of baseball in general, it’s tremendous. For me, it’s just a privilege to wear and to try to keep that legacy. It makes me want to be at my best. And that’s what I tried to do my whole career.” While Rivera was known for his excellent pitching, a signature “cutter” fastball, and calm demeanor, his baseball career was also marked by awards and community work. Hall of Fame induction ceremonies are always interesting and magnetic. When athletes who have done remarkable things in their sport are honored, there is often humility and introspection from them that adds to the greatness of the ceremony. Mariano Rivera wasn’t the best baseball player in Major League Baseball history although he received 100 percent of the vote and he didn’t have the social impact of a Jackie Robinson but he is the right person to carry the number “42“ into the Baseball Hall of Fame for likely the last time ever.